A wall of fire protects the inexperienced villagers of Second Eden from a planned invasion of dragons and Nephilim, but how long will the flames last? Book 4 in the Oracles Of Fire fantasy series by Bryan Davis. Every decision could mean the difference between survival and catastrophe. A wall of fire protects the inexperienced villagers of Second Eden from a planned invasion of dragons and Nephilim, but how long will the flames last? Billy, Walter, Ashley, Elam, and the faithful dragons help the people prepare, but they are woefully outnumbered and will have to go back to Earth and recruit the humans who have the ability to revert to their former dragon states. In search of aid, Billy escorts Acacia, an Oracle of Fire, through a dangerous volcano portal. Meanwhile, Sapphira, Acacia’s Oracle sister, stays in the underworld with Bonnie and Shiloh, waiting for the signal to emerge and join the battle. With Hades and Earth locked in a catastrophic merging of their two realms, Arramos, evil incarnate, plans to use Bonnie to add Second Eden to the merging of the worlds, thereby drawing his forces to Heaven’s Gate, where he hopes to gain access to divine authority. 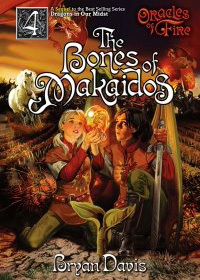 Arramos has two secret weapons: Sir Devin, the greatest of all dragon slayers, lies in wait to destroy all dragons and their offspring, including Billy and Bonnie; and Mardon, a brilliant scientist, knows the secret to the Oracles’ indestructibility, and he has devised a way to steal it from Acacia, thereby draining her strength. During these preparations, Semiramis, Mardon’s mother, comes to Second Eden and provides Billy with a wealth of information about Arramos’s plans, and with every subsequent challenge, her words are proven true. But can she be trusted? With mysteries abounding and an ultimate battle looming, only a prophesied sacrifice can stop the onslaught of evil. But who will be the sacrificial lamb?